We found this recipe on CiaoFlorentina. 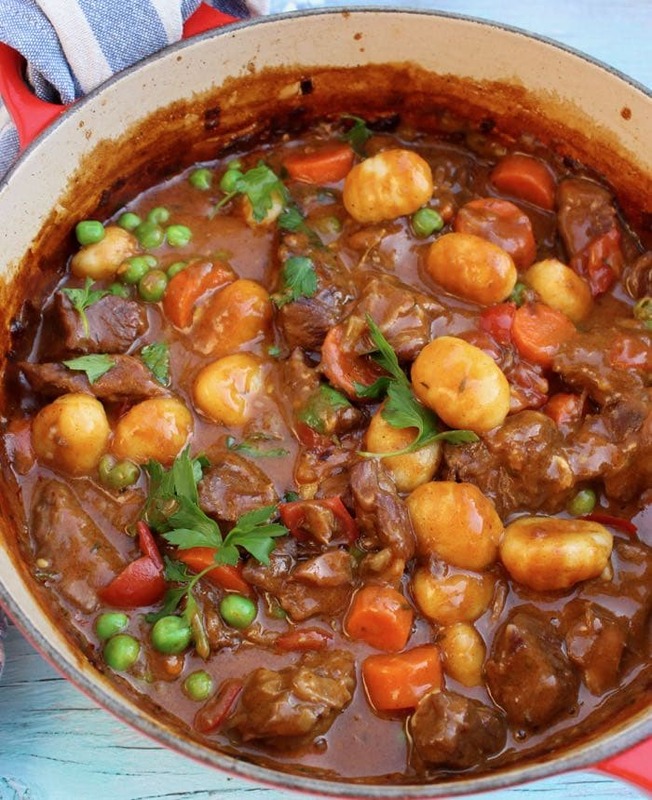 "An easy and hearty homemade beef stew made with fork tender grass fed chuck roast and potato gnocchi dumplings, in a smoky paprika gravy with subtle hints of clove." Season the beef cubes with sea salt and black pepper and toss to coat well with 2 tablespoon of olive oil. Working in batches so you don’t overcrowd the pan, brown the beef in the hot pot. Transfer to a bowl and keep warm. Deglaze the pot with the warm water whisking as you add it to break up any lumps that might form. Bring to a simmer. Add the beef cubes back to the pot, the bay leaf, whole cloves and thyme. Cover with a tight lid and allow it to simmer together for 2 1/2 hours stirring occasionally. Add the potatoes and carrots to the stew, turn the flame up to med-low and simmer partially covered for another 20 minutes or so until the potatoes are cooked through. Remove from heat. If using potato gnocchi add them in the last 5 minutes of cooking or boil separately then add them to the stew. Adjust seasonings to your taste and serve the homemade beef stew with crusty bruschetta and sprinkled with the fresh parsley. Follow the above steps and after you added the beef cubes back into the stew cover with a tight lid and transfer the pot to the hot oven. Cook for 2 hours then add the carrots and potatoes or dumplings/gnocchi. Cook an additional 20 minutes or so until cooked through and the beef is fork tender. Add the beef, onion, garlic, sea salt, potatoes, carrots, cloves, thyme and bay leaf to the slow cooker. In a bowl whisk together the water with the flour and paprika. Pour over the ingredients and drizzle with the olive oil. Cook on hight for 5-6 hours or on low for 11 -12 hours.